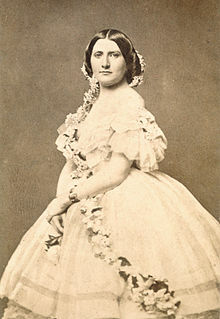 Harriet Rebecca Lane Johnston (May 9, 1830 – July 3, 1903), niece of lifelong bachelor United States President James Buchanan, acted as First Lady of the United States from 1857 to 1861. She was one of the few women to hold the position of First Lady while not being married to the President. Her parents were Elliot Tole Lane and Jane Buchanan Lane. When she was 9 years old, her mother died. Two years later, her father also died. She became an orphan. She requested that her uncle, James Buchanan, be made her guardian. Thus, Buchanan became her guardian. He arranged for her education. She received a very good education. In 1854 she went to London to live with her uncle, James Buchanan. There she attracted the attention of Queen Victoria of the United Kingdom. She gave her the title of “dear Miss Lane”. In 1857, her uncle became the President of the United States. She became the First Lady. She was a popular First Lady, and was very active. Women of that time even copied her hair style and style of dressing. People describe her as the first of the modern first lady. After her uncle retired, they went to live in his big home at, Wheatland near Lancaster, Pennsylvania. From her young age, she had met many persons. Within next 18 years, she saw many deaths: her uncle, her husband, and her two young sons. After this, she moved to Washington to live. She gifted a large collection of her art works to the government. An official of the Smithsonian Institute once described her as the First Lady of the National Collection of Fine Arts. She also donated a large amount to build a facility for invalid children at the Johns Hopkins Hospital in Baltimore. She married when she was 36. Her husband was Henry Elliot Johnston. Her husband was a banker from Baltimore. After her death, she was buried at Baltimore, Maryland. This page was last changed on 11 January 2014, at 04:56.